I helped save a downed Chinese airliner on a remote Alaskan island! Well, 15 years ago I did, ha ha. It’s been 15 years, almost to the month, so I’m sure I’m not remembering every detail correctly… feel free to point out any mistakes if you happened to be there, ha ha. Early morning on April 6th, 1993, when I was still a field combat medic in the Navy and living on a remote Alaskan island (yes, really! ), a Chinese airliner encountered some kind of severe turbulence and had to land on the even more remote Alaskan island of Shemya. 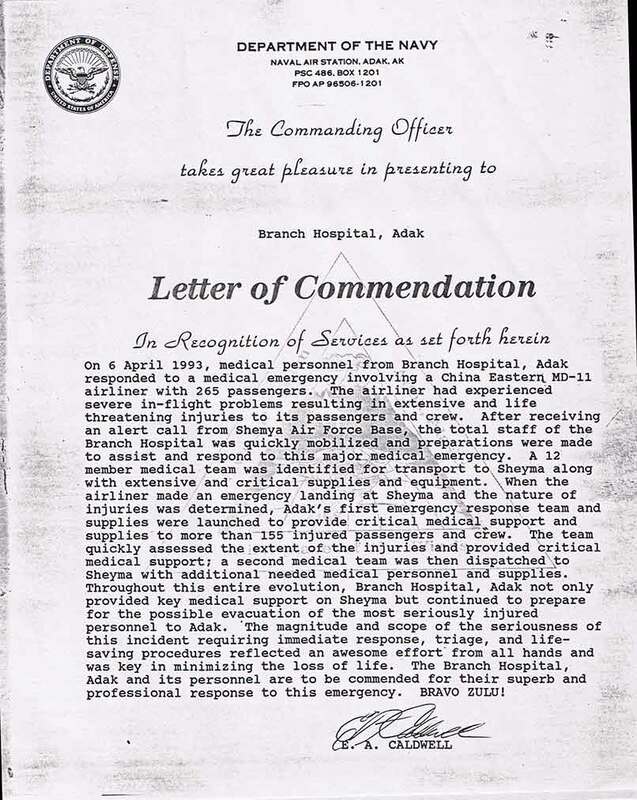 I was on duty in the emergency room that night, and volunteered to fly the quick hop over to Shemya and start processing the wounded. This a notice from Congress for us! 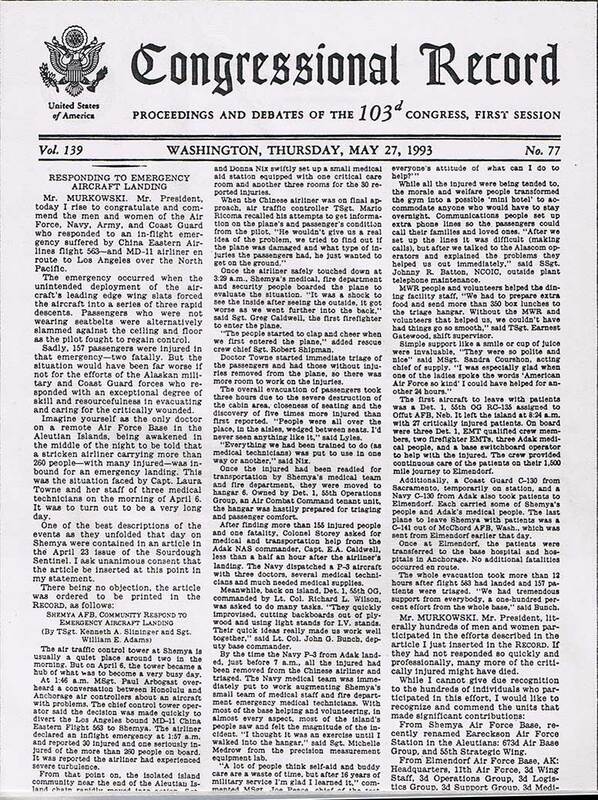 Click to read the full Congressional Record! 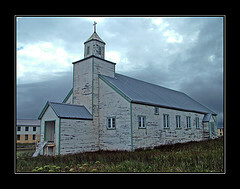 See photos of Adak, then and now! Click READ MORE below to read more, and see more pix and maps! Shemya is little more than a pit stop for airplanes to refuel, and the few military personnel who lived there were particularly tough, but they were not equipped to handle a disaster of that size. 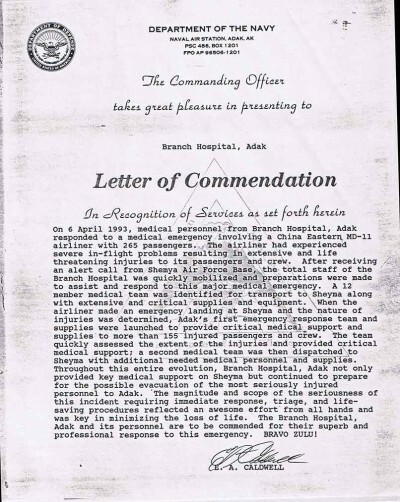 I arrived in the second plane load of medical personnel to find the Chinese passengers all spread out in the airplane hangar, most laid out on makeshift cots. It was a crazy, long day. I got lots of opportunities to improve my IV insertion techniques and cut off clothing with trauma scissors. The language barrier was a big obstacle, too. I don’t know if anyone on either of our islands spoke Chinese, but luckily some few of the passengers spoke some limited English. We got everyone stabilized, except for one poor soul who died. 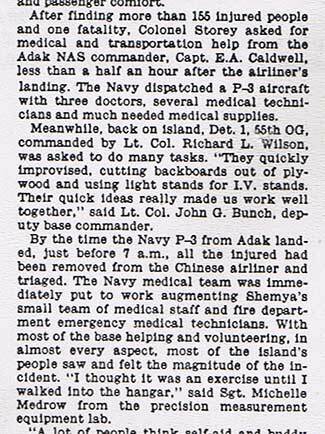 Later that day, a big plane from the mainland in Alaska arrived with medical teams to medivac the wounded back to Elmendorf Air Force Base hospital. I made the long trip (7 or 8 hours?) from Shemya to Anchorage with my patients, monitoring IV bags and vitals. It was quite a day for all of us on the Adak medical team. 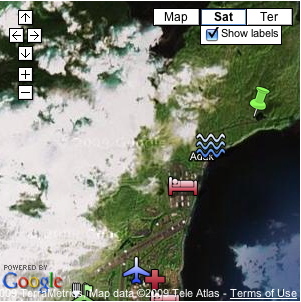 Be sure to check out my Google Map with interactive labels, too! You’re a hero! I always knew it……I’m a nurse too, so I can imagine how good you must have felt helping to save all those people! Wow!!! You were stationed out there? I lived in Dutch Harbor for three years, and I’m an EMT so I have a special place in my heart for combat medics. This is so cool! Thanks for posting this. You are an amazing person. You are such an inspiration. Awesome! 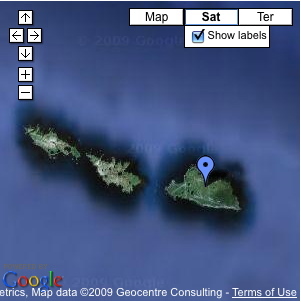 I was stationed on the arm pit of the aleutians, Shemya, in 1980. We had a crash then where several people lost their lives due to the horrible weather conditions and lack of medical facilities. Wrong e-mail address. See change. Wow, a Shemyan! Such a small world! Bravo, Calpernia! Happy Veteran's Day to you!!!! You are a hero on so many levels. Your bravery on taking your place in the world on your terms amazes me. You tell people of your journey in a way that you inspire all to make the changes they need to find their true self and where they want to be in life with an honest grace seldom seen. God Bless you. So this is your BIG military highlight? The military does this stuff ALL the time. It's not a huge deal.